China has recently introduced the Chengdu J-20 and Xi’an Y-20 Military Transport Aircraft, launched the H-20 test flight, accelerated the deployment of the BeiDou Navigation Satellite System (BDS), developed the successful Quantum Anti-stealth Radar, and launched its new type large destroyer. At this backdrop, the “China threat” theory is on the rise again in western countries. The fact is that China has always maintained an unswerving commitment to world peace. The bloody slaughter of WWⅠ and WWⅡ, and the havoc they wrought on mankind shook the world. In pursuing peace and development, China has always challenged the cold war mentality and zero-sum game. China aims to use the Belt and Road Initiative as a platform to strengthen connectivity and exchanges between countries, by following the principle of discussion, collaboration and win-win cooperation. China will not interfere in other countries’ domestic affairs, will not exert dominance over regional affairs, and will not establish its own sphere of influence. The idea of building a community of shared future for mankind is a legacy and an extension of China’s diplomatic policies at different developmental stages. From “the five principles of peaceful coexistence” to “reform and opening up”, then to the current ideal of “building a community of shared future”, China’s diplomatic policies fully manifest the CPC’s idea of global governance, security, and development, and its honorable approach to interests and justice. The core of major country diplomacy with Chinese characteristics is building a community of shared future for mankind. The thinking behind a community of shared future reflects the key theme of China’s diplomacy and the pursuit of common human values. Peace, development, fairness, justice, democracy and freedom are the common values of mankind. It presents China’s global vision and sense of responsibilities as a responsible major country that aligns its own development with global development. It offers the world to share the outcomes of China’s rise and development. The thinking of building a community of shared future points out the future direction of global development and human progress. The world is now confronted with many challenges: the trend of economic isolationism, sluggish long-term economic growth, a widening gap of unbalanced development, frequent regional conflicts, terrorism, mass migrations of refugees… Global issues keep arising, different social ideologies meet in fierce collisions. Against such a backdrop, China holds its vision on global governance as to pursue peace, development, and win-win cooperation, and oppose war, eliminate poverty, and avoid confrontation and hegemony. It was right in this time of unrest that the U.S. president Donald Trump signed into law the National Defense Authorization Act for Fiscal Year (NDAAFY) 2018 with a budget up to $700 billion, in which it lists in optional Congress opinion No.1259 clause that the U.S. is studying the feasibility of inviting Taiwan to participate in “Exercise Red Flag” and normalizing port calls and the transfer of defense equipment to the island by the US Navy. Even more, Trump referred to both China and Russia as strategic competitors in his speech on national security strategy, which is obviously counter to the trend of peace and development and represents a major threat to world peace. Even though China has continued to develop new military forces and equipment, it has never invaded any other country, nor even deployed offensive weapons overseas. China’s strategic missile deployments are all within Chinese territory. Only the few Chengdu J-20 fighters, mainly used for educational and scientific research and drills. The army has just been officially equipped with Xi’an Y-20 Military Transport Aircraft but the principal requirements for aircraft engines remaining to be developed are still far behind China’s actual strategic requirement. The H-20 bomber is still under development. China has always lacked adequate strategic counterattack forces. The H-6k is an outdated product introduced from the former Soviet Union in 1960s, which no longer meets the need for strategic counterattack. China’s Air Defense and Anti-missile System and its Anti-stealth Radar System are all deployed within Chinese territory. China’s military might, that causes such agitation to foreign powers, will only be used for self-defense. In contrast to the practice of other countries, China has not deployed its aircraft carrier battle groups in foreign offshore areas. It has not deployed the Lockheed Martin F-22 Raptor, the Rockwell B-1 Lancer, the Northrop Grumman B-2 Stealth and Strategic Bomber, the Airborne Early Warning-Control Aircraft, reconnaissance aircraft, and electronic-jamming aircraft close to the borders of foreign neighbors, or threatened their security by holding joint military exercises nearby. China’s strategy is based on proactive offshore defense, the core of which is sovereign security. We will never give up our rightful entitlements or sacrifice the fundamental rights of our country. As President Xi Jinping has said : “ No country should presume that we will compromise on our core interests or that we will swallow any ‘bitter fruit’ that harms our sovereignty, security or development interests.” China is capable of annihilating any enemy who dares to attack. In addition to the hardship it has suffered in developing its own navigation system, and despite previously suffering discrimination and technology blockade, China’s reason for integrating its most advanced BDS with Russian GLONASS and U.S. GPS can be attributed to its principle of peace-oriented action. China does not intend to use its advanced technologies to control or threaten other countries. Instead, its aim is to better serve the establishment of a community of shared future for mankind. China will not be crushed by oppression or blockade. The harder the measures employed, the greater the incentive to overcome hardship and strive for innovation. To date, China has made certain progress in attaining control of outer space, and developing near space equipment, anti-missile early warning and interception capacity, and second-strike nuclear forces. 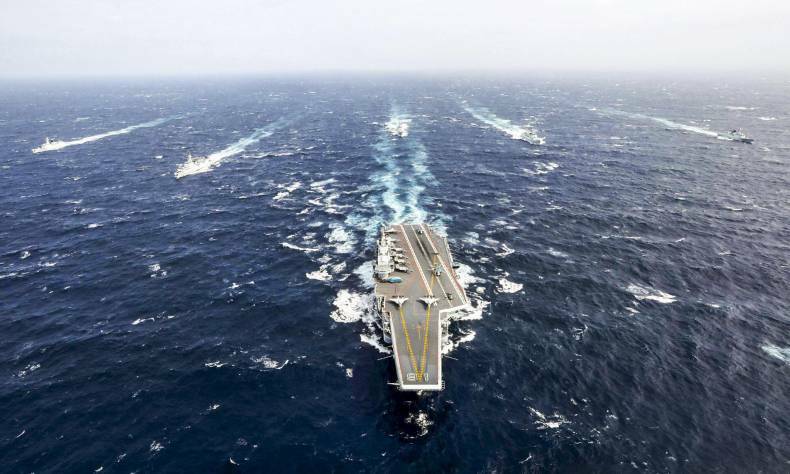 Since China gained the capability of offshore combat, the time has passed for foreign aircraft carriers to swagger around China’s coasts. China has achieved certain progress in the development of laser weapons, kinetic energy weapons, electromagnetic weapons and artificial intelligence. However, China has never used these for its own benefit by threatening or extorting from other countries; rather it has used them for its own self-defense. The “China threat” theory concocted by the Western powers is just another manifestation of the cold war mentality emanating from their power logic. Chinese traditional culture emphasizes that you should treat others as you would wish to be treated, and places a high value on peaceful exchanges between countries. Hence China will not conquer other countries with warships. Our ships carry civilization and friendship. At present, there are still considerable non-traditional security issues that hamper globalization. Extremism, terrorism, and piracy are still common. Regional, racial and religious conflicts are exacerbated. The south-north divide and economic crises are making the world increasingly insecure. The peacekeeper was on alert during his mission in Libya . As the main force for UN peacekeeping, China is now “the builder of world peace, a contributor to global development and an upholder of international order”. Even though overseas peacekeeping armies face bloodshed and sacrifice, China still adheres firmly to the higher principle of upholding world peace under the guidance of the UN framework, still strives to prevent conflicts and wars from developing, and still tries to promote peaceful resolutions. In more than 40 years of peacekeeping exercises, China has increased its engagement as the international situation changes, in accord with its own power and international status. On June 1, 2016, China’s Mali peacekeeping camp was attacked by terrorists, and soldier Jia Liangliang died in the fight. On July 10 the same year, one of the Infantry Fighting Vehicles of China’s South Sudan peacekeeping infantry battalion was hit by a rocket projectile, and two Chinese soldiers were killed. Chinese peacekeeping personnel have always remained loyal to their mission, risking their lives to protect the safety of UN staff and refugees in mission areas, and practicing China’s sincere pledge to safeguard world peace. At the moment, more than 2500 Chinese peacekeepers are working in 10 UN peacekeeping areas, taking charge of missions including patrol and alert, security, engineering support, air patrols, search and rescue, air supply, and medical services. China’s effort has won international recognition, and China’s peacekeeping army is a shining example of military diplomacy. With deeper economic globalization, China’s economy has already integrated with the wider international economy. An increasing number of Chinese companies are reaching out to the outside world and have become a powerful driver of global economic growth. The safety of overseas Chinese companies, non-traditional security threats, the fight against piracy, crisis responses, and overseas Chinese evacuation all call for the Chinese army to take external actions. The development of China’s military forces aims to sustain world peace and development, to uphold regional stability, and to protect China’s overseas interests. It is certainly no hunt for power and threat. China is a keen contributor to world peace and the guardian of security for mankind.